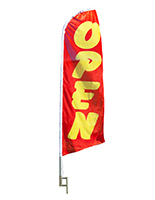 This open banner is perfect for outdoor use. 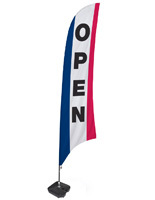 The 13' tall pole and flag come with a weighted base and anchors. 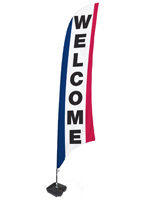 Each of the polyester banners is red, white and blue for a patriotic and eye-catching display! 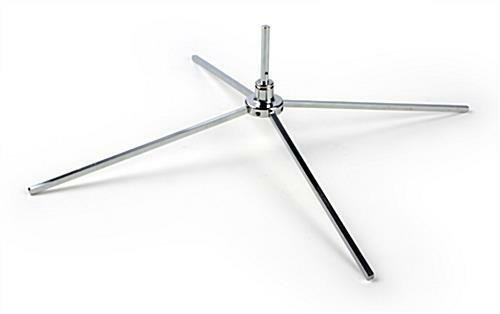 The anchor base can be attached to dirt or grass with ease. Please note that while the flags can withstand use outside, it should never be left up when there are over 20 mph winds. The banners can be seen from far away making them perfect for advertising purposes! Please Note: These banners are NOT designed to be used in winds exceeding 20 mph. The cross base is not designed specifically for outdoor use by itself. When used outdoors, it is strongly recommended to use the included water bag for extra weight and stability.